Today’s post is brought to you by the Tarot Blog Hop, which, if you haven’t come across it before, is the blogging equivalent of a round-robin. You can click on the links at the bottom to see the previous and next posts. The topic du jour for this edition of the blog hop was given as Ostara: Paint a journey with new life. Hmm, I thought, what on earth am I going to write about that? I’m not religious at all*; profound discourses on the meaning of life are best saved for late nights with wine and there are far too many people preaching sharing their insights on how to live your life, so I’m not going to go there either. *I regard religion in much the same way as I regard sport: it’s something other people do (or get worked up about), and that’s fine with me as long as they don’t make too much noise. I may occasionally watch or take a passing interest in, but I don’t regard myself as a follower. For me, Easter is just a long weekend to be spent with family and a jolly good excuse to stuff oneself with (the children’s) chocolate eggs and, perhaps, have a nice bit of lamb. I’m afraid this rather lacks the profundity demanded by such a grand title, which evokes great artworks or philosophical musings. But wait… this is a Tarot blog hop…Phew! I’m saved! The marvellous thing about Tarot is that, despite what certain elements may want you to believe, it really doesn’t have to take itself seriously. You can do deep and meaningful when the occasion demands, but you can also do frivolous and playful. Easter most definitely falls into the playful category: bouncing lambkins, egg-laying rabbits, chocolate-smeared children and all manner of fecundity. I’m not sure where the hats (bonnets) fit into all of this but I’m sure there was a reason once (probably the Victorians – they were great ones for inventing traditions). Yes, new life, as celebrated by bizarrely confused traditions with largely forgotten origins. What strange apes we are. It reminds me a little of the monkey and banana experiment – we no longer know why we do these things, but it’s tradition. But, I am rambling digress. Returning to Easter/Ostara, it is all about the bunnies really, isn’t it? Yes, alright, and the chocolate, but as far as I am aware there isn’t a Chocolate Tarot. (Now there’s an idea that hasn’t been exploited yet! 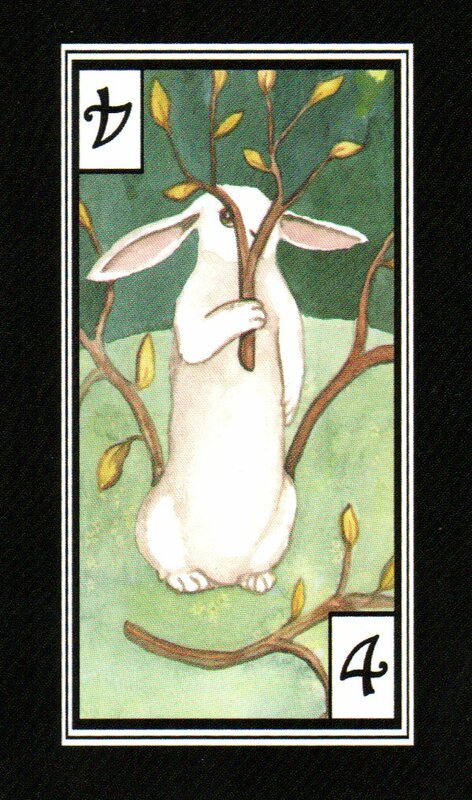 Mmmm, Pralines = Earth, Truffles= Air, Chilli Chocs = Fire, Liquers = Water) Anyway, thinking about Easter, the utterly delightful Rabbit Tarot hopped immediately to mind, as I mused about how best to bring the Tarot into play. Renewal and revitalisation is also a characteristic of this time of year with all the new life and other springy things – lambs going boing and suchlike. What new energies are coming into my life? 4 of Carrots: According the accompanying meanings leaflet, this means “need to be alone, to rest“. The suits in this deck are Sticks (Wands), Tulips (Cups), Carrots (Swords) and Daisies (Pentacles). My own equivalent interpretation of this card (4 of Swords) is rest and recuperation. I’m not sure this is a good thing, since I had rather been expecting something more…well…bouncy, as a new energy. Ho Hum, I’m not going to complain about relaxation but I hope it doesn’t mean that I’ll be at too much of a loose end work-wise. What needs revitalising in my life? King of Sticks: “an honest and thoughtful man” Well, that’s my DH and combined with the previous card, perhaps we are going to have a relaxing and revitalising Easter, which is rather more encouraging. If you read my blog, you’ll know that we had a rather splendid Christmas and more of the same would be most welcome. 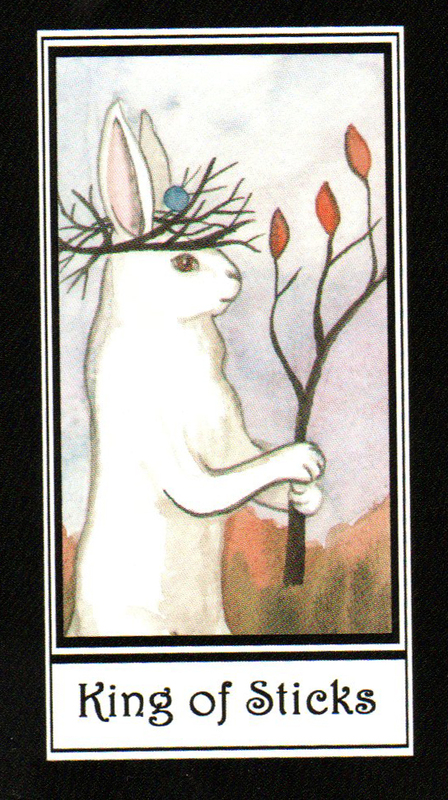 I must admit that is not how I’d normally describe the King of Wands (not my DH at all) – I tend to think more of a loud and larger than life Brian Blessed character – but perhaps his rabbit doesn’t share those characteristics. Where is the chocolate hidden? In a safe place then! It’s a really cute deck! Luff the spread – and the cards that you drew for it lol! Ive never seen this deck before and ur blog has made me look into the work of this intelligent artist Nakisha. Im like you too, i love chocolate easter eggs! isnt that the best part? WOW…did this spread ever speak to me! Thank you! And I LOVE LOVE LOVE the deck you chose! Perfect!! This is my favorite kind of spread. Short and sweet. Now off to find my own chocolate. And buy that deck. Love it! It IS all about the bunnies, isn’t it? Lots of food for thought in your post. I like the first bunny, all turned away from the drama. I’ll try to remember this spread. Everyone needs to know where the chocolate is hiddne.